Always plan ahead and research campgrounds before making reservations (and reservations are almost always needed). Not every park is pet-friendly, and some have amenities like kayak rentals or beach bonfires. Some parks only accommodate RV campers, while some don’t allow large vehicles. 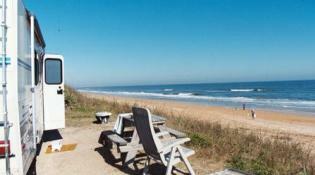 Flagler County is also home to additional campsites near the Intracoastal such as Princess Place Preserve. So pack your s’mores kit and grab your bathing suit. 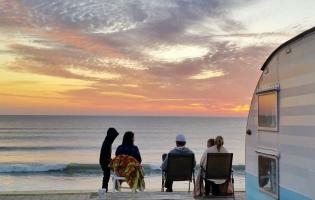 Here’s your guide to outdoor camping in Palm Coast and the Flagler Beaches. Named after the iconic Floridian folk singer Gamble Rogers, this park is one of the best places to camp if you want a magnificent view of the Atlantic Ocean. Gamble Rogers has everything you’re looking for in a park, and this 145-acre has plenty of fun perks like volleyball courts, nature trails and kayak/canoe rentals by the campground. At certain times of year, campers can witness live sea turtles hatching and watch the babies make their way to the ocean. In the off-season, there’s still plenty of gorgeous wildlife to see such as ospreys, herons and storks. Campers can stay overnight in their tents with access to water, electricity, picnic tables and a fire ring. 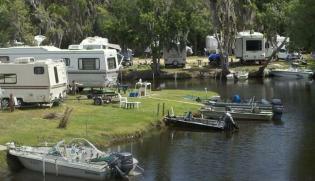 If you’re traveling in an RV, the Beverly Beach Camptown is one of the few beachside campgrounds in Florida where you can park your large vehicle. Overlooking the ocean, this park allows campers to have many fun-in-the-sun activities like fishing, hiking and swimming. Even if you don’t own an RV, Beverly Beach visitors can still request permission to camp on the beach in tents or rent one of its few cabins. When camping here, visitors can take advantage of its laundry facilities and two full-service bathhouses. If you’re looking for a campground that also has good fishing opportunities, this is your place. Whether you’re camping with a tent or in an RV, head to Bull Creek Campground, a 1,005-acre wide preserve that surrounds Crescent Lake and is loaded with docks for fishing along with a convenient bait shop located inside the Bull Creek Fish Camp. Campers can simply relax by the water and wait for the line to hook a big catch. And once you’ve snagged your catch of the day, take advantage of the park’s public grill to cook your freshly caught fish. 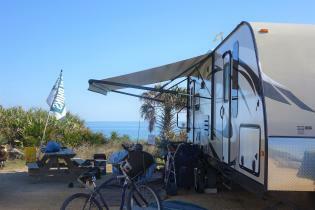 Flagler-by-the-Sea Campground is one of the most conveniently located beachside campgrounds. It’s near food trucks, a pub and a store along the scenic stretch of A1A. The park accommodates large vehicles like RVs, while campers can set up tents on the sandy white beach. Picnic tables, chairs and public barbecue grills are also scattered throughout the campground. 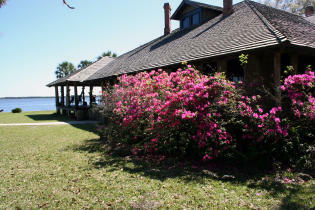 Princess Place Preserve with its rich history and 1500 pristine acres attracts nature enthusiasts from near and far. Visitors can take in the environment on one of the many hiking trails, spend time fishing in the salt marshes along the Matanzas River and Pellicer Creek, or camp out under the stars. The preserve is a popular spot for equestrian enthusiasts. With an equestrian campsite and plenty of riding trails it is easy to embrace nature while enjoying a ride. Come and visit us for a glimpse of old Florida. Whether you hike, horseback ride, canoe/kayak, camp, fish or picnic, you will have memorable experience at Princess Place Preserve.